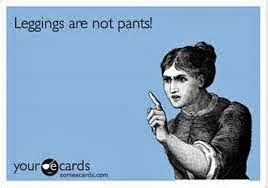 Ergo...my musings by Vivian: A Friendly Reminder~ Leggings Are Not Pants! Stacy & Clinton are retiring their wit and wisdom; as such, it is up to those who love fashion and have a sense of decorum (no matter how limited it may be) to remind those fashion-challenged persons of a few simple rules. Since autumn is upon us, it is now time for that friendly reminder to the women of the world. Please repeat after me: “Leggings are not pants!” Again! Let me hear a chant! 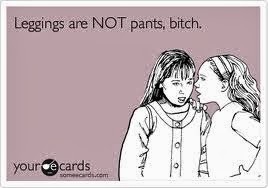 Leggings are not pants! I know. Leggings are “comfortable”. I LOVE leggings – particularly the wonderful Zella leggings one can find at Nordstrom. 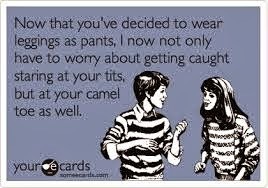 I wear them under tunics, skirts, short dresses, and to yoga. Zella leggings are durable, comfortable, and versatile. And, there is no reason one cannot run an errand or have a quick drink after a workout while still wearing one’s workout clothes. In fact, if all women were as gorgeously fit and tasteful as my yoga instructor, Jill, this would not be an issue. Again, I love my leggings. And it matters not if you wear them with nary an accessory but pearls while you are at home. But, please be considerate of others. Note to Anita: I have not indulged in wine yet!